Worlds collide when botanist Nika Temsmith from the year 3797 meets up in the present year 1921 with explorer William Pike. Their love triggers the end of the universe. Science fiction and adventure make up the elements of this quirky love story by writer Jeff Lemire (Sweet Tooth, Animal Man). The 8 issue miniseries kicks off with a special flip-book style debut issue, devoting equal time for the reader to discover each protagonist's background story separately. This of course also sets up and leads to their fateful encounter. Design-wise, Trillium issue 1 is nicely done with it's special credits page highlighted by the miniseries' brilliant logo. Given the logistics with the flip-book format, Lemire is forced to tell Temsmith and Pike's individual stories with a huge amount of panels. Though he does devote some one-page and even some amazing two-spreads to each character, the pages do feel a bit overwhelming with the amount of small panels utilized. Lemire litters this initial story by highlighting some tragic or poignant points in the protagonists' histories. In Pike's case, his traumatic memories from being a soldier in the first World War, creeps back into his life. For Temsmith, haunting flashbacks from a relative guide her throughout life and her encounter with the mysterious aliens. Suffice to say, Lemire's use of these elements will certainly play a grander role as the series progresses and serve as great introductory points to our characters. It seems greater focus was bestowed on Pike's past as Temsmith's story even on the cover. Lemire throws in a lot of detail and dialogue with this debut issue as well, creating a problem where the dialogue balloon sometimes dominates the tiny panels. Closeup scenes have to be limited because of this. Lemire does an excellent job linking both time periods together forcing the reader to tediously flip back and forth both stories. For those familiar with Lemire's art style, it remains as charming as ever here. The contrast in Lemire's work is noticeable during Pike's flashback scenes as he uses an even rougher and less refined feel, providing a great transition from the main story. 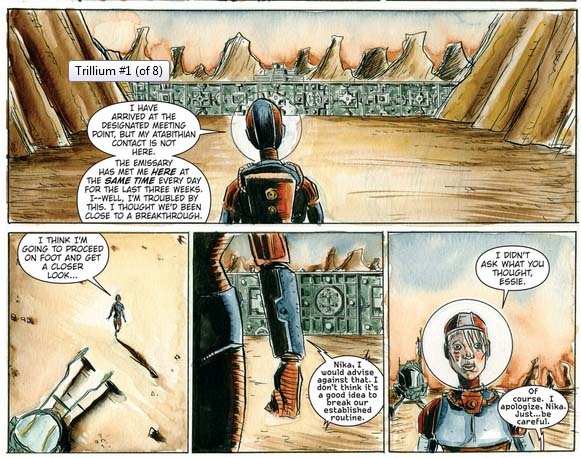 Additionally, Lemire's color work truly balances out his rough style in certain scenes from Pike's story. In Temsmith's story, the colors give the future a retro look beyond the bland world of technology. 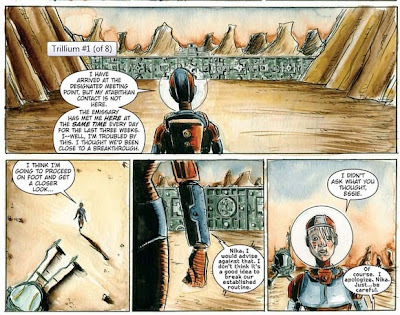 There's a whole lot waiting to be revealed in the story presented by Lemire and Trillium issue 1's ending certainly hooks readers in immediately into the main narrative.